Just outside the picturesque hill-fort town of Montefalco in Umbria lies the 170 hectare estate of Antonelli San Marco. Fifty hectares are dedicated to grape production. The property was acquired in 1882 by the Antonelli family from the Papal States and has been run by the family ever since. Today, it is managed by Filippo Antonelli who is assisted by oenologists Massimiliano Caburazzi and Paolo Salvi. The winery produces 300,000 bottles/year of non-filtered red and white wine. Excellent olive oil and other typical farm products are also grown on the estate. On a beautiful spring morning we visited the estate, where Signor Filippo Antonelli served as our host and tour/tasting guide. The property is beautiful and in addition to the vineyards and other agricultural sights, Antonelli San Marco includes an agriturismo, Casale Satriano, where guests can stay on the estate in one of six apartments. After a pleasant walking tour we settled down to the important business of tasting the wines of Antonelli San Marco. All of these wines are hand picked and non-filtered. We began with a 2016 DOC Grechetto dei Colli Martani, a 14% alcohol, 100% Grechetto grape wine. (The high alcohol content was due to frost damage.) This wine was very pale straw in color and had a pleasant fruit nose. Like most Grechettos it finished medium short but smooth. I rated this wine an 87 and recommend it as an aperitif. Our second white wine, a most pleasant surprise, was a 2015 DOC Trebium Trebbiano Spolentino, a 13.5% alcohol offering made from 100% Trebbiano Spolentino grapes. It was aged in 25 Hl. oak casks for one year. Pale straw in color with a light fruit nose, this wine finished medium long and extremely smooth and delicious. I was very pleased with it. I rated this wine a 90/91 and highly recommend it. Filippo Antonelli in the wine cellar. PHOTOS: TERRY DUARTE. 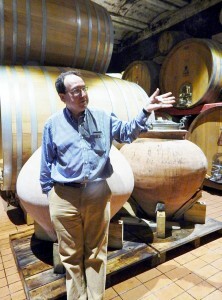 Next Signor Antonelli offered us an experimental wine, a 2015 Antiprima Tonda. This wine was a 13.5% alcohol, 100% Trebbiano Spolentino but it spent 8 months in contact with the skins in ceramic containers. The result was a wine of yellow color with a light fruit nose. It finished longer than the Trebium and very pleasant. I did not rate this wine as it was experimental, but it is well worth noting. We moved to the red wines with a 2013 DOC Montefalco Rosso, a blend of 70% Sangovese, 15% Sagramtino and 15% Montepulciano/Merlot. This 13.5% alcohol wine was aged in 25 Hl oak casks for 12 months followed by 6 months in cement tanks and finished by 6 months in the bottle. It was garnet in color with a light fruit nose. This excellent example of this blend finished medium long and very smooth and I rated it a 90. Our second red was a 2011 DOC Montefalco Rosso Riserva, a 14.5% alcohol wine of the same blend as the Montefalco Rosso above. The blend was aged for 6 months in lightly toasted 500 liter oak barrels, then in larger 25 Hl oak casks for 12 months. Clarification followed in cement vats and then further aging of 12 months occurred in the bottle. The resulting wine was a deeper garnet in color with a strong fruit nose. This superb Riserva finished long and very smooth and I rated it a 92. Next we tried a 2012 IGT Umbria Rosso Contrario, a 100% Sagrantino grape wine of 14.5% alcohol content. Fermentation occured at 25°C in contact with the skins for 15-20 days. Aging was in stainless steel vats for 18 months followed by clarification in cement vats for 3 months and then 6 months in the bottle. The result was a wine with a deep garnet color and a fruit and leather nose. It finished fresh, medium long with a slight fruit taste. I rated this wine an 89. Our last wine was a 2011 DOCG Sangrantino di Montefalco, a 100% Sagrantino 14.5% alcohol offering. This wine was fermented with the skins for 25-40 days at 25-28°C. Aging consisted of 6 months in lightly toasted 500 liter oak barrels followed by 18 months in 25 Hl oak casks, then settled in glass lined cement vats for 12 months. A further 12 months aging in the bottle was the final step. The finished product was a wine of very deep garnet color with a light leather nose. It finished very long and smooth and I rated this superb wine a 93/94. All of the wines produced by Antonelli San Marco were excellent examples of Umbrian wine and well worth a purchase. They are available throughout the U.S. In my opinion Rosso di Montefalco is one of the best bargains in Italy. Thanks to Signor Antonelli for his hospitality during our visit.